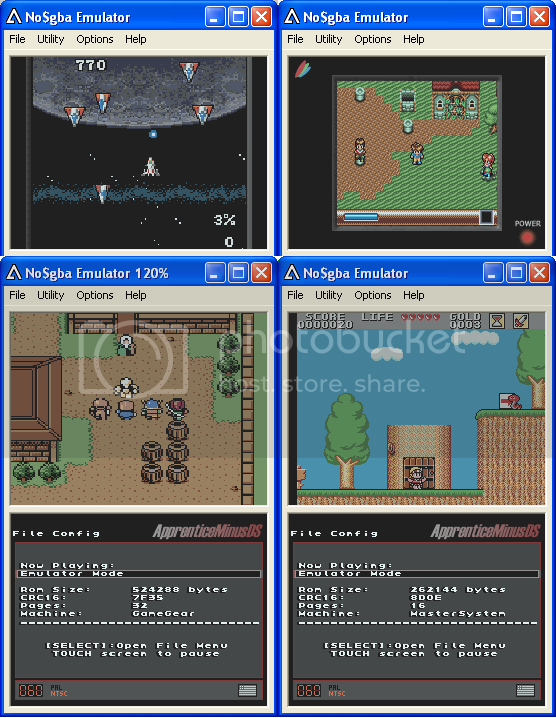 Project description: ApprenticeMinusDS is a Nintendo DS Gamegear and Sega MasterSystem emulator that uses hardware rendering. This version has scaling support for Gamegear mode and a region selection option, to enable playing of multi-region games in non-Japanese mode. The hardware renderer was completely rewritten to support the scaling, but there was not enough time to test it, and there are some known (and unknown bugs) that i introduced, that will be fixed as soon as possible. Mostly it should be fine though. See the readme for more info on known issues and how to get around them, if possible. Touch the "CONFIG" icon to enter Settings ingame. See readme.txt for more infos. I'm not sure if emulators are applications or not, oh well. Anyway very nice release. I wonder if a new Jenesis would get released. What else should they be? They're completely normal applications, surely not games. The SMS will always be one of my favorite systems and it's so nice to have a near-perfect emulator for it on the DS. Especially since there's no nasty squishing or cropping of the screen needed for most SMS games to fit on the DS screen. Thanks so much for this excellent emulator. Even though it's "just" a side project of jenesisDS, it's my favorite emu on the DS. The only thing I could ask for is analog input for games like Woody Pop and Alex Kidd BMX Trial that used the SMS paddle. The touch screen should work well, though I'd really like to see actual paddle support using the Taito Paddle.